A Rotherham-based HR specialist is going the extra mile for Rotherham Hospice by hosting a special charity walk to celebrate ten years of trading in the town. The event is the first in a series of planned activities being organised by staff at the The HR Experts to celebrate its tenth anniversary which will raise money for local charities close to the hearts of members of staff employed by the firm. Saturday's event saw 16 members of staff, clients and friends take part in a 10km charity walk to work, setting off from Rotherham Hospice before finishing at the company's Swallownest headquarters with a celebratory slice of well-earned birthday cake. Led by company founder Sharon Swift, the route saw participants walk through Broom and Whiston before taking on a gruelling climb up Guilthwaite Hill, marching through Aughton and arriving at the company's headquarters based on Rotherham Road. Sharon Swift, managing director at The HR Experts (UK) Ltd, said: "To mark our tenth anniversary, we wanted to do something special to support the local communities we serve, whilst challenging ourselves both physically and mentally. It seemed quite fitting to organise a charity walk to mark the ten years since we started taking our first steps in business. "Walk to Work is the first of what we hope will be a series of events designed to support the local good causes. All members of staff are being given the chance to make their mark on the celebrations and I'd like to thank everyone who will be giving up their time so generously to help us mark our anniversary, all in the name of a good cause." 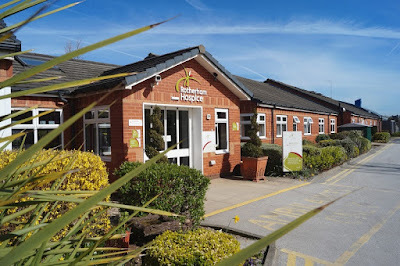 The only adult hospice in Rotherham for the people of Rotherham, Rotherham Hospice is an independent charity and must raise significant sums of money each year in order to pay for the quality care provided free of charge to patients, their families and carers. The charity needs £5m a year with half of that needed to be raised each year through voluntary support.